When Padmé Amidala died and Anakin Skywalker turned to the Dark Side, their twin children were separated: Bail Organa took Leia to Alderaan to be raised as a princess and one day a senator, and Obi-Wan Kenobi took Luke to Tatooine to be raised as a moisture farmer. “We found the computer outlet, ma’am,” Threepio interrupted. Leia turned her back on Han and moved next to the droids. Ben was already at a monitor; he tapped a few keys and a map of the station appeared on the screen. A little hatch opened on Artoo’s barrel-shaped body and a metallic claw extended to connect with the computer banks. Leia moved closer, trying to look at the screens in a way that suggested she understood what was happening. After a few moments Artoo began to beep. On one of the screens, yellow lines began to move rapidly. Leia leaned closer. 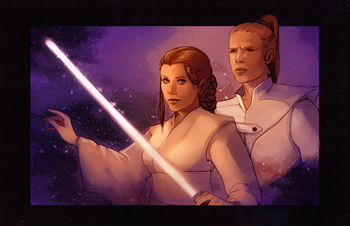 Ben studied the images for a moment longer, then looked up at Leia, Han and Chewie. Before Leia could protest, Ben had released her hand and, adjusting the lightsaber on his belt, slipped out of the room. Leia caught a glimpse of his back as he treaded silently down the long gray hallway before the door slid closed again. “Boy, you said it, Chewie,” said Han. Leia felt her mouth hanging open. She closed it as Han rounded on her. Artoo’s sudden whistle cut her off. “What is it?” she snapped, rounding on the droids. Behind her, Han snickered. “Who has he found, Threepio?” said Leia impatiently. “Don’t be jealous, Solo,” Leia sneered over her shoulder. “What are you talking about?” said Han loudly. “I’m not going anywhere,” Han announced. Han folded his arms across his chest and glowered. Chewbacca let out a low growl. Leia stepped in close to him, her face upturned and her brown eyes fixed intently on his. “You’ll get it,” she said. Han hesitated, wavered as if about to step away. He stared at her. “I better!” he said finally. “All right.” Leia turned back to the droids and the computer monitors. Behind her back, Han and Chewie exchanged glances. Han put his hands on his hips. “What?” he mouthed. Chewie let out a low, irritated growl. “Okay!” said Leia. Han and Chewie quickly looked away from each other. Follow Jill on Twitter @JillScharr. Illustration by Amber Harris.